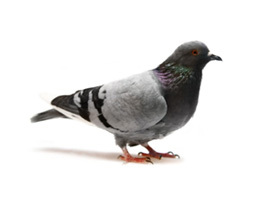 Bird proofing and pigeon pest control in Staines, Weybridge, Twickenham, Shepperton, Richmond. Often referred to as ‘rats with wings’, feral pigeons have become just as much of a problem in towns and cities as their furry, four-legged counterparts. Pigeons have been known to carry diseases such as Chiamdiosis, a virus similar to influenza, and Psittacosis, similar to pneumonia. An undisputed and particularly visual pigeon problem however is mess. Combined pigeon deposits can weigh up to several tons and costs £15 million a year to clear up. Droppings not only cause buildings to look unsightly, but can cause long term damage. Fresh droppings, whilst unpleasant, pose no risk to health. It is dried droppings that can potentially spread infection. Spores from the droppings can be inhaled as dust and carried on the wind. It can cause a flu like illness in healthy people, but poses more serious problems to those with low immunity. Pigeons not only pose problems in residential areas, farmers also suffer from pigeons harming crops.